But first, let me take a selfie! Selfies are the answer to all those old photographs in albums where one person is always missing because someone had to be the one taking the photo. Now with front facing cell phone cameras it’s much easier to see that everyone is in the picture. It’s also a way to commemorate special occasions quickly and easily. To see what you were wearing and who you were with and what a good time you were having. Modern technology makes it so much easier to record memories. Which makes the selfie stick a fantastic invention. As anyone who has ever tried to take a selfie with more than three people knows, it’s not always easy to squeeze everyone into the frame. Sometimes your arms just aren’t long enough! This is where your selfie stick comes into it. Selfie sticks allow you to lengthen your reach and take your perfect selfie without having to rely on anyone else. A selfie stick lets you get a shot of you and that amazing view behind you to show off where you are when you’re on holiday. With a selfie stick you can fit all your friends into the frame so that no one gets cut out or excluded. Everyone gets to be in the photo! A selfie stick can also help you achieve beautiful photos in your surroundings. Do you want to include those gorgeous blossoms in your shot? By sticking your selfie stick into the tree you can get them to frame your image! Want to get that rainbow at the waterfall behind you? You can use your selfie stick to get the perfect angle! In this age of instant memory making, the selfie stick is the perfect corporate gift to help you achieve those wonderful photos. Our selection of great selfie sticks come with adjustable phone clips and extendable shafts so that you can get your best angle. 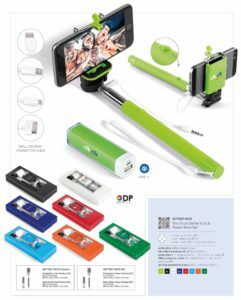 Selfie Stick Power Bank Set – A power bank and a selfie stick are the perfect power couple no matter if you’re going on holiday or just spending the day out with your friends. A selfie stick is a great way to capture those wonderful memories to cherish forever. Our Starstruck set has a 2200mAh power bank and a selfie stick as well as a 3-in-1 connector cable so that the power bank can connect to most devices. All of this comes with a beautiful microfiber bag and in a selection of eight matching colours so that it really is a unified set. The set even comes in a matching presentation box, because we know that presentation matters. 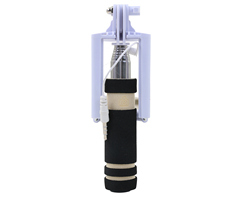 Selfie Stick Power Bank – If having a power bank and a selfie stick was having a good idea, then having a selfie stick with a remote that functions as a 4600mAh power bank is a great idea! That’s what has happened with the Selfie Stick Power bank. It’s the ultimate combination of power and pictures so that you won’t run out of juice when you’re in the middle of capturing the most perfect sunset you’ve ever seen. Selfie Sticks help you to capture memories just how you want to remember them, and the best tool for that job is the Selfie Stick Power Bank. 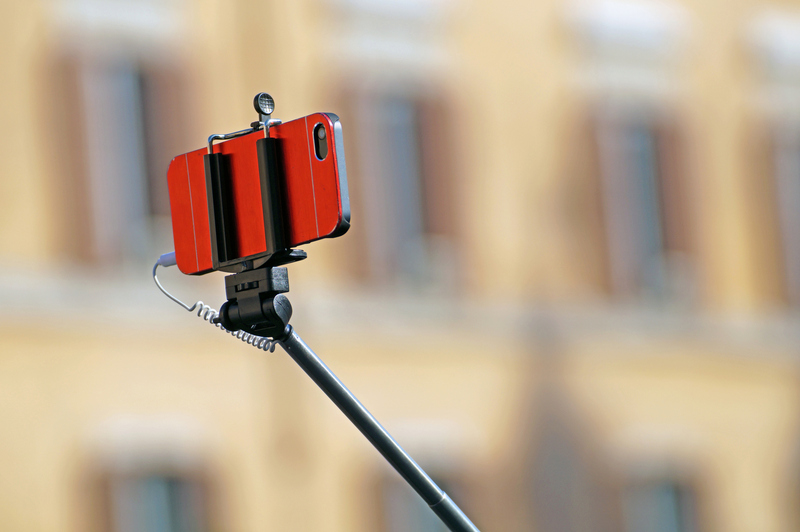 Selfie Stick Johannesburg – Selfie sticks are all the rage and this one is a great gift! This neat-o selfie stick comes with a telescopic rod and a grip as well as a clip that fits most smart phones. The handle of the stick is usually the thickest part to provide the best grip and also act as a counterweight to the phone on the other end. Selfie sticks are great, useful gifts that are practical and bring fun with them wherever they go. With all these wonderful options, Corporate Gifts Johannesburg has a great selection of Selfie Sticks Johannesburg. Mini Selfie Sticks are super great promotional items because they’re small and compact. This makes them perfect for travelling around with, whether it’s road trips or overseas, you’ve always got that handy selfie stick tucked into your suitcase. And at 14cm long and 4.5cm wide, this mini selfie stick is small enough to fit into a pocket or a handbag. Mini in size: Maxi in fun! Evidence of early selfie sticks has been found dating back to 1925, early on in the history of the camera. One such case shows a man taking a photo of himself and his wife with a long pole that extends out of the frame of the photo. This kind of image isn’t all that uncommon. People are innovative and when we face a challenge, we work out a way around it. From a long pole to the extendable monopod that we use today. Selfie sticks have made appearances all throughout history, from the 1969 science fiction film, I Killed Einstein Gentlemen, to the first telescopic extended patented in 1983. The ‘Narcissistick’ as it has been dubbed by some critics has a much longer history than most people imagine. 1995, 2005 and 2012 all saw different versions of the stick across the globe, but it wasn’t until 2014 that the moniker of ‘selfie stick’ became wide spread. These days Selfie sticks come with a plethora of features from power banks and speakers to remote controls to make sure that you get your perfect photo taken at just the right moment. Selfie sticks make wonderful corporate or promotional gifts for tour groups or for travel agencies. When you’re going away. A selfie stick is the perfect travel gift. Not only is it a reminder to have fun and make memories wherever you are but it lets you take pictures no matter if you’re travelling by yourself or with a group. A tour group can fit into the frame with a selfie stick and if you’re travelling alone, you can get all the wonderful views in as well as yourself. So no matter the occasion, a selfie stick is the perfect gift for making memories! To place an order or find out more about the selfie sticks that we have to offer, you can send us an email at info@brandinnovation.co.za and we’ll be happy to assist you. We are proud suppliers of Selfie Sticks Johannesburg! Posted in Corporate Gift Ideas.